The New Classical Academy offers a classical education in a nurturing, individualized learning environment that uses a balance of rigorous academics, creative hands-on projects, and child-directed play to create self-motivated critical thinkers who truly enjoy coming to school everyday. 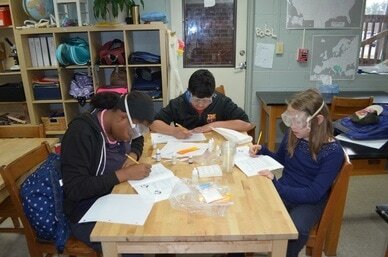 Our philosophy encompasses cooperative, multi-age learning, as well as independent, self-directed study. The school is alive with real science experiments, dramatic presentations, debates, art projects, music, classic literature, and manipulative math. As our educational philosophy recognizes that children need time for both work and play, child-directed imaginative play and outdoor play are a substantial part of every day at our school. The New Classical Academy curriculum combines individualized progression through the basics -- reading, arithmetic and mathematics, and handwriting -- with a rotating school-wide course of study in the sciences, history, geography, and literature. As students gain mastery of the more mechanical aspects of scholarship, they are able to manage increasingly advanced presentation and exploration of the material. The classical concept of the trivium guides our presentation of the material we teach, giving students first the knowledge, then the understanding, and finally the creativity to approach each subject in the fullest way. In this way, we make knowledge attainable to all students, regardless of their learning differences. Our school graduates thoughtful young men and women who are strong readers, adept mathematicians, skilled writers, and enthusiastic leaders with an extensive working knowledge of history, science, geography, and the arts. A classical education is shaped by the concept of the trivium, three progressive stages of learning that mirror and leverage children’s natural cognitive development in order to cultivate academic growth. 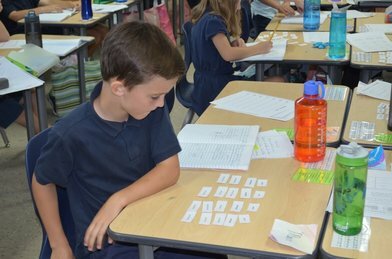 During the grammar stage (roughly, elementary school), students learn the rules of all their subjects—phonics, reading, spelling, grammar, and basic computation. They also accumulate facts, expanding their vocabulary and acquiring information about history, science, geography, and more. In the logic stage (roughly, middle school), as their capacity for conceptualization grows, students begin to apply abstract thought to the material they encounter. They learn to look for “logic” across all subjects—the cause and effect of an historical event, for example, or a chemical reaction, or the structure of a well-written paragraph. With this foundation, students graduate from our school well prepared for the rhetoric stage of high school, when they are expected to develop and test their own hypotheses, analyze texts and other material, and formulate their own persuasive arguments. A classically educated student also studies Latin, great works of literature, and history in a continuum from ancient to modern.